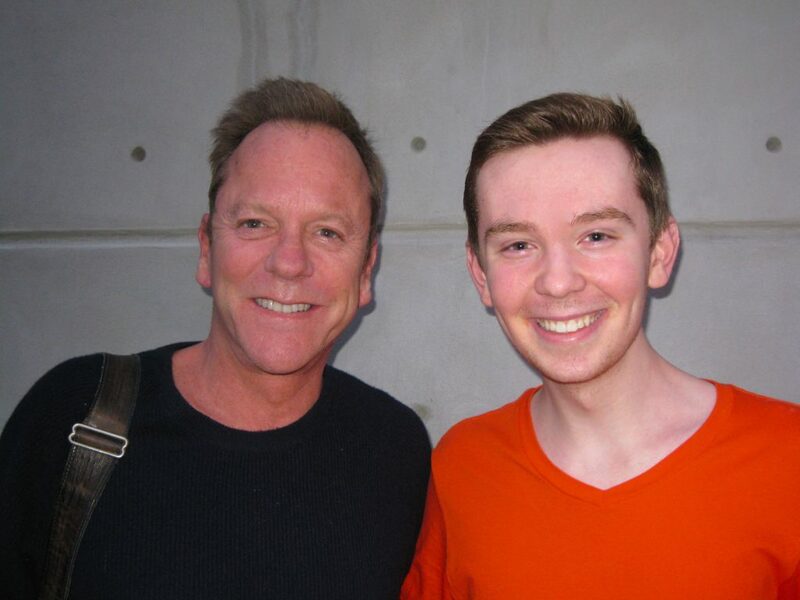 With “Designated Survivor” and “24”‘s Kiefer Sutherland, in Albany with his band. Lights Camera Jackson has been co-starring in photographs with his favorite celebrities from the entertainment, news and sports world since he was 6 years old. Jackson’s first picture with a celeb was snapped in January of 2005, at the Center For Disability Services Telethon in Albany, NY. “American Idol” host Ryan Seacrest was making a VIP appearance at the event. Jackson, a big fan of the show, approached Seacrest during a break and asked for an autograph. The “Idol” star eagerly obliged. Jackson and Ryan then posed for this photo. Since that day Jackson’s collection of photos with stars of stage, screen, TV and sports has grown to over 400. Many of them are featured in the Gallery section of his website. And each of the photos not only represents a special moment in time in the life/career of Lights Camera Jackson, but also includes its own story. Where and when each photo op took place, and what the interaction was like before, during and after the camera captured the moment – these are all element that, together, make each image uniquely special. 1) Be Polite. Never interrupt someone if they’re talking or busy. And always start with “excuse me” and “please”. Don’t forget – you’re asking a total stranger for a favor. 2) Be Patient. You may have to wait several minutes (or longer) for an opportunity. That’s OK. If it’s an official appearance (book signing, Meet & Greet, etc.) bring water and wear comfortable shoes. 3) Don’t be Shy. When that moment comes – GO FOR IT. Always introduce yourself by name. 4) Be Prepared. The best experiences come when you begin by saying something nice to the celeb about them. 5) Stay On Top of the News. Watch for rumors or announcements about someone famous coming to your town and then make a plan. 6) Do Your Homework. Know who it is you’re looking to meet. Do research on their life/career. It will be valuable when the time comes. 7) Thank You! As excited as you may be after getting that photo don’t forget to say thank you. 8) Write It Down. Yes, you’ll have the photo to remember the magic moment, but take a minute to write down a few details as well. These notes will come in handy when you share the story with others and provide tidbits when you post the selfie online. The Answer: Check-out the full Gallery to find out!